"Everybody has got the idea wrong. They think it is all about kicking and punching and they do not understand that 'way of life' thing about it. And that what it is supposed to do is improve the texture and your way of life, and the life of those around you." Since the first movie camera began to roll, the action genre has been an enormous force in the motion picture industry. In the silent film era, all it took was a look, or a series of out-of-this-world moves to pull an audience member. Today, action films are pushed to the limits with intricate special effects and unbelievable martial arts. The latter style is the focus of the recently released documentary, The Art of Action, a look at the evolution of martial arts in film. From the earliest uses and styles to today's seemingly repetitious use of wire-aided stunts, this film does a fine job of chronicling the ever-changing world of martial arts. From Bruce Lee to Jet Li, the Peking Opera to John Woo, The Art of Action excels at offering more than a collective glimpse of the best martial arts over the past century. Infused with interviews and narration by the legends that have lofted martial arts into the mainstream, the documentary offers a condensed look a the history of the ancient art. The viewer learns of the origins in the Peking Opera, where the study of kung fu and other martial arts gained prominence after the dissembling of the order of the Shaolin monks. Soon though, as if the direction of the documentary were turning on a dime, the viewer is thrust into the history of the arts in film. Normally, this would not be a problem, but the opening half is much more interesting. I admired the way in which the filmmakers slow things down to go into the origins and the progression from stage to film, but we're thrust too quickly into the world of Kurosawa and other filmmakers and their use of martial arts in film. A more gradual transformation would have better served the subject. That said, the more modern look at the martial arts is a mixed bag of problems. The careers of the legends (Lee, Chan and Li) are handled quickly and fail to offer insight into the backgrounds of these genre stars. By the time the documentary reaches its closing moments, we've see interviews with John Woo, Tsui Hark, and Ringo Lam, each landmark directors of Asian cinema, but the footage offered is that of the directors' American films. I admire Face/Off as a stellar achievement in action filmmaking, but compared to Woo's films made previously in his homeland, it pales. It feels as though The Art of War is going for popularity rather than history. For fans of the martial arts genre, The Art of Action offers enough worthwhile insight to warrant a look. The evolution of the arts in film, while too brief, is interesting. Take for instance that women were actually the pioneering performers in the film medium, as men felt that film was too much of a step down from staged productions. There should be more bits like this, little nuggets of wonderful information, in this film. Image Transfer Review: The Art of Action uses numerous aspect ratios, the most common being 1.33:1 full-frame. Clips from various films are presented in nonanamorphic widescreen, generally 2.35:1. The full frame portions show a lot of grain and softness as well as poor detail and sharpness. The widescreen clips look fine when it comes to the more modern day offerings, while the aged clips look understandably washed out and damaged. Certainly not the best transfer on the market. Audio Transfer Review: The sound for The Art of Action is presented in Dolby Surround and is very basic. Dialogue sounds fine with no dropouts or distortion, while the surround speakers are used periodically to provide sound for several of the film clips. 6 Other Trailer(s) featuring The One, Crouching Tiger, Hidden Dragon, Double Team, Time and Tide, Universal Soldier: The Return, and Maximum Risk. Extras Review: Trailers are provided for: The One, Crouching Tiger, Hidden Dragon, Double Team, Time and Tide, Universal Soldier: The Return, and Maximum Risk. 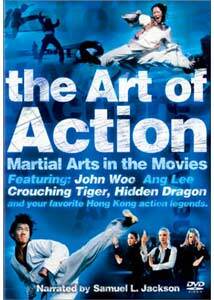 The overall package of The Art of Action will likely entice fans and is worth a look. Those who only have a passing interest would do better reading a book about the subject as it is likely to more insightful.